Providing real-time insight into security and emergency situations for better control, precise intelligence gathering, comprehensive situational awareness, and more informed decision making. Industrial operations face constant safety and security threats, which require real-time response solutions that provide rapid, precise and reliable situational awareness. Airobotics has developed a platform that provides security officers and emergency responders with a professional tool for collecting unlimited aerial data and providing real-time visibility into security threats and emergency situations. Security operations are simplified with pre-defined missions, and emergency response is enhanced through on-demand availability. The completely automatic platform autonomously deploys and lands the drone, and collects aerial data to be processed and analyzed. Real-time aerial video and photos are delivered directly to personnel on the ground, enabling more informed decision making in times of emergency situations or during routine patrols. The Airobotics platform eliminates the logistics involved in drone operations, while providing reliable, scheduled and on-demand aerial data collection, premium processing and analytics capabilities. In addition to security and surveillance, another solution Airobotics provides is drone for industrial inspections, which may be of great assistance to a variety of industrial operations. 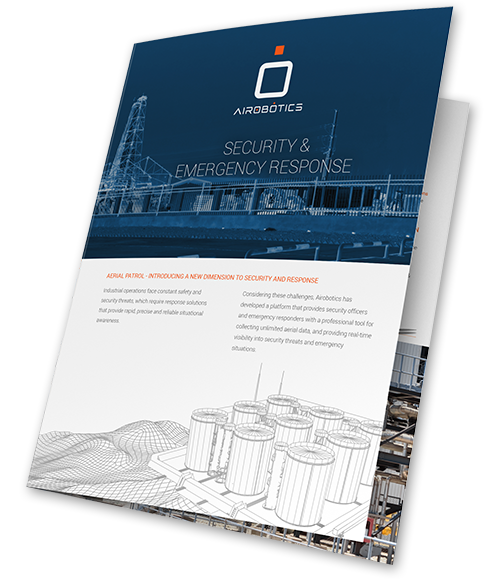 To find out how you can use the Airobotics platform for security operations or emergency events, download the complete brochure. Industrial operators face constant safety and security threats, which require response solutions that offer rapid, precise and reliable situational awareness. Given these challenges, Airobotics developed a platform that provides security officers and emergency responders with a professional tool for collecting unlimited aerial data, and gaining real-time visibility into security threats and emergency situations.